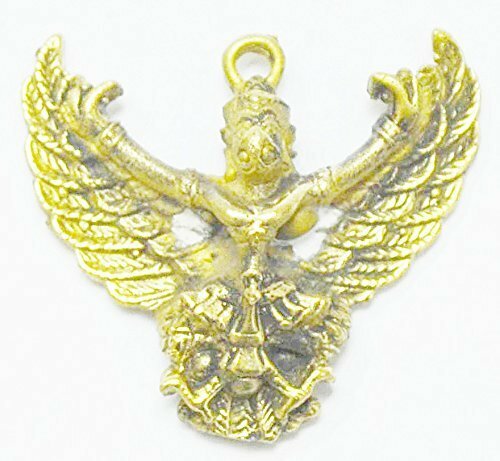 :This is Garuda amulet.Garuda is the amulet for protection of dangerous and harmful thing. **You can use this amulet as a cool unique Pendant** In Hindu mythology, a Garuda is a lesser Hindu divinity, usually the mount (vahanam) of Vishnu. Garuda is depicted as having a golden body, white face, red wings, and an eagle's beak, but with a strong man's body. He wears a crown on his head. He is ancient and has size enough to block out the sun. Approximate Size: 2.5 CM Wide x 2.5 CM Height. If you have any questions about this product by Thai Amulets, contact us by completing and submitting the form below. If you are looking for a specif part number, please include it with your message.